Celebrity Heights | How Tall Are Celebrities? 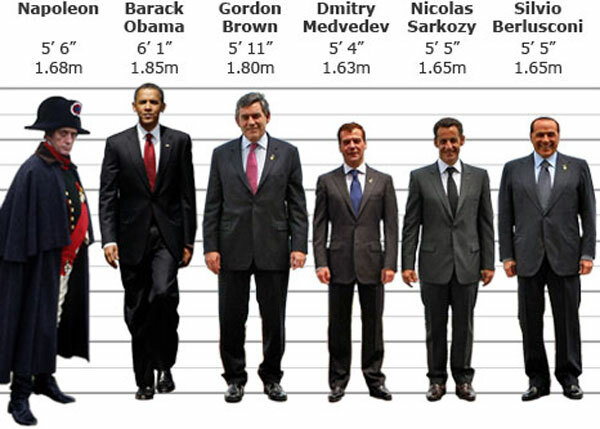 Heights of Celebrities: How World Leaders Measure Up? How World Leaders Measure Up? There is a deepening row in France over the alleged lengths gone to by President Nicolas Sarkozy's aides in order to conceal his short stature. In a Belgian TV report, the employee of a French factory visited by Mr Sarkozy admitted being chosen to stand behind him because she was no taller than him. The report became an internet hit over the weekend and other workers have since backed the allegation. But the charge has been robustly denied by the president's office. A spokesman for the Elysee Palace called it "completely absurd and grotesque". But the president has been mocked by the opposition Socialists for his "complete stage management". - In a world where a carefully manipulated image (and sometimes stack heels) are essential, definitive vital statistics can be hard to come by. The heights shown here are those most commonly recorded for each world leader. - Russian President Dmitry Medvedev, for example, is variously reported as being between 5'2" and 5'4" tall. - Napoleon's height was once commonly given as 5'2", but many historians have now credited him with another 4 inches owing to a miscalculation between French and English units of measurement. President Sarkozy visited the Faurecia factory in Caligny in Normandy, northern France, on Thursday last week as part of a drive to defend his management of the economy. After a tour of the plant, he addressed factory employees while standing in front of a group of workers, who were all about his own height or shorter. In a subsequent TV report by Belgian network RTBF, an unnamed employee confirmed she had been chosen to share the stage with President Sarkozy because she was no bigger than him. Faurecia's management released a statement on Monday to "deny the rumours that the Elysee had made any 'special requests' as regards the staff present during the president's speech", reported French news agency AFP. But French websites Le Post and Rue89 have since quoted union representatives at the plant, some of them named, as confirming that height criteria for staff to appear with Mr Sarkozy had been received by the management. President Sarkozy is reported to be extremely touchy about his height, which is believed to be about 5ft 5in or 5ft 6in (165-168 cm). 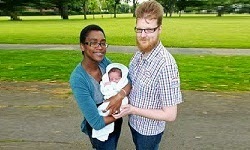 He has previously been pictured wearing shoes with a substantial heel and giving speeches standing on hidden platforms. The French media have also previously noted the propensity of Mr Sarkozy's wife, the former model Carla Bruni-Sarkozy, to don flat shoes when in the presence of her husband. Is Mr Sarkozy's height worthy of so much debate in France? Let me know what you think using the comment box below.